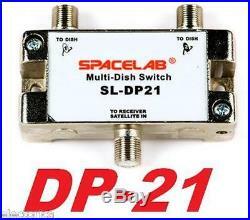 NEW DP-21 SATELLITE MULTI-SWITCH. GUARANTEED TO WORK %100. Two inputs for use with up to three orbital locations. Can be used with a DishPro Twin (or DishPro Quad LNBF) and a DishPro Single LNBF to provide three orbital locations to one tuner. Does not require power insertion. Can be used indoors and outdoors. DP21 Switches can only be used with DishPro LNBFs. For three orbital locations: a DishPro Twin LNBF (or DishPro Quad LNBF) with a DishPro Single LNBF. For two orbital locations: up to two DishPro Single LNBFs. When used with a DishPro Twin or DishPro Quad, one port provides 110º and 119º. Either port of the DishPro Twin or DishPro Quad can be connected to any LNBF port (“To Dish”) on the DP21 Switch. DishPro Installations can support up to 200 RG-6 cable lengths, from the LNBFs to the furthest receiver. A DP21 switch can be placed anywhere in the installation, but placement closer to the receiver is recommended. Dual-tuner receiver or two single-tuner receiver installations: The feed from the DishPro Single LNBF can be split to two DP21 switches, but a DishPro-approved splitter must be used (see the “DishPro Approved Accessories List”). One side of the splitter blocks the communications between the receiver and the LNBF, but will allow the satellite TV signal to pass. On this receiver, the Check Switch will read “Feed” in the Device row. NOTE: The receiver whose DP21 switch is connected to the passing side of the splitter must be plugged into a live power outlet at all times. If not, the DishPro Single LNBF will not have any power and will not be able to provide satellite signal to the other receiver. Cascading is connecting more than one switch together in series to achieve more outputs than one switch can provide. Meaning you can connect this switch in series with an extra extra switches such as DP34 or DP twin or quad LNBs. Allows to receive signals from different satellites, combining and connecting them to your receiver. No power supply is required. Heavy duty; Zinc die-cast and chrome treated outer shell. VERY SIMPLE AND EASY TO SET UP. CHECK OUT MY other items. WE DO NOT OFFER ANY TYPE OF INSTALLATION OR PROGRAMMING INSTRUCTIONS OF ANY KIND PROFESSIONAL INSTALLATION OR PROGRAMMING RECOMMENDED. 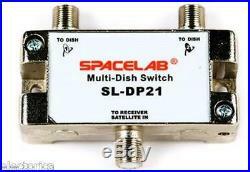 The item “DP-21 SATELLITE MULTI-SWITCH Dish NETWORK DP34 DP21 LNB DISH PRO DISHNET DPP 500″ is in sale since Friday, September 26, 2014. This item is in the category “Consumer Electronics\TV, Video & Home Audio\TV, Video & Audio Accessories\Satellite Signal Multiswitches”. The seller is “electorica” and is located in ROCHESTER, NY. This item can be shipped worldwide.